I am a big fan of Michael Pollan’s writing. I was first grabbed by 2008’s In Defence of Food, which led me to The Omnivore’s Dilemma from 2006. These books – absorbing, fascinating, infuriating and entertaining – are great reading. Pollan may be writing about weighty things but he wears his learning and research lightly. The Omnivore’s Dilemma is a realistic but discouraging account of American food and eating, from industrial to organic, locally produced to self-foraged. It’s the kind of book that makes you wonder just what you should eat. In Defence of Food, subtitled An Eater’s Manifesto, is Pollan’s answer to just that question which he boils down to just seven words: “Eat food. Not too much. Mostly plants.” He also argues against what he calls ‘nutritionism’, the idea that food is all about scientifically determined nutrients – for example, we are told to eat mackerel because it contains omega-3 fats rather than because it just tastes good. Food Rules is the condensed, quick read version of these books. Taking his seven word summation as a guide, this slim volume gives you 64 rules to help you enjoy a healthy diet. Some of them are entertaining but thought provoking (it’s not food if it arrived through the window of your car; don’t ingest foods made in places where everyone is required to wear a surgical cap), others deadly serious: eat well-grown food from healthy soil; pay more, eat less. Unrealistic? Perhaps, if you try to stick rigidly to all Pollan’s rules, but you will probably be surprised by how many of them you already implement. If you’re trying to make humane and environmentally sustainable choices about how you eat, then you’re probably more than half way to following his guidelines. That, and your meals just taste really good. If you’re interested in cooking, eating or feeding your family this is the book that you really need to read. Michael Pollan is on Twitter at MichaelPollan. 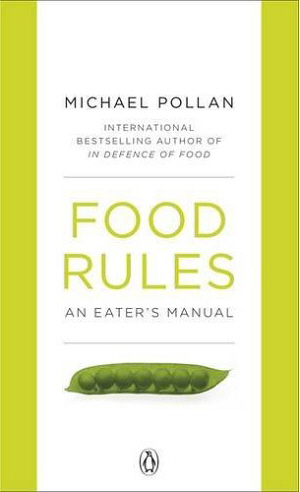 Food Rules by Michael Pollan is published by Penguin. All About Food, a blog that started in Christchurch, New Zealand and is now living in North Cork, Ireland.